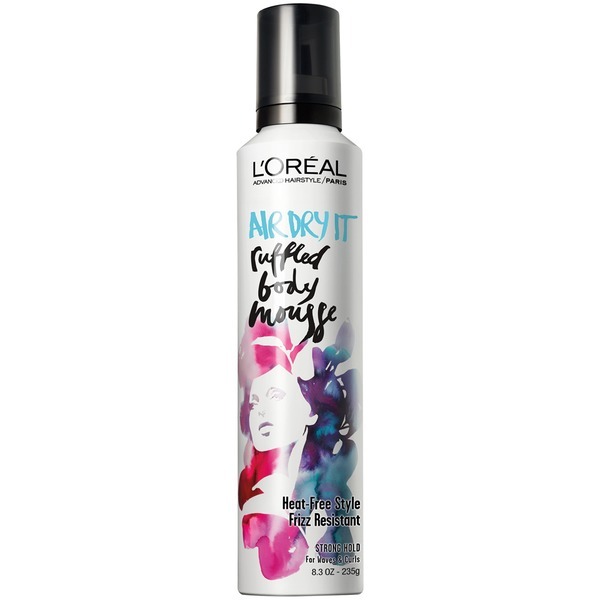 L'Oréal Paris introduces new AIR DRY IT Advanced Hairstyle hair mousse. Create and control your perfect hairstyle without the heat damage. Enhance your hair's natural shape, definition, and texture with wavy hair mousse. No residue left behind. This rich, lightweight foam builds body, enhances waves and curls and provides hold. Get beautiful, natural, effortless style. AIR DRY IT. • Shake well. Hold can upside down and dispense an egg-size amount of product into palm. Apply to clean, damp hair. Evenly distribute product from root to ends. Scrunch hair and AIR DRY IT. TIP: For added body, flip your head upside down to scrunch. Directions: Shake well. Hold can upside down and dispense product into palm. Apply to clean, damp hair. Evenly distribute product from root to ends. Tip: For added body flip your head upside down to scrunch. Shake well. Hold can upside down and dispense an egg-size amount of product into palm. Apply to clean, damp hair. Evenly distribute product from root to ends. Scrunch hair and AIR DRY IT. TIP: For added body, flip your head upside down to scrunch.